Good evening. I'm sending this message to share that although there hasn't been a family missing their greyhound, there was an incredible response from Greyhound Adoption League of Texas where they were able to provide shelter and care. For the many occasions that I've assisted animals in distress (primarily dogs) in the neighborhood - this greyhound by far was the sweetest, and the one most deserving to help that may care for her properly. 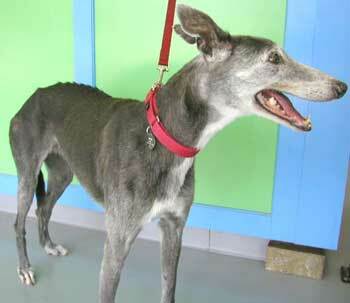 Fortunately, GALT was able to come out and pick up the greyhound, so that she would not be left in the heat of the day. I know how difficult it is to place or foster dogs for adoption, and I give a tremendous amount of credit to this group. Mercy was a shared Greyhound... we don't know where she came from but once she was a GALT Greyhound she was blanketed with love by everyone who shared in her care. I first met Mercy when she became Stephanie and Ken's foster. Steph and Ken and I go way back... they were foster parents to my Mandy, and I shared fostering Kitty with them. They took in and then adopted my foster Lucy when she and another one of my fosters (Ellie) had a little disagreement. Then they adopted my foster Benny. 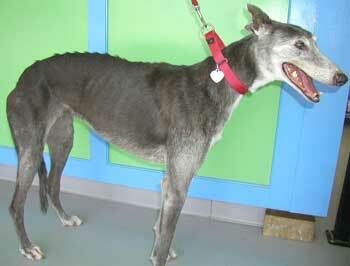 Whenever they needed me to I would take care of Mercy and her two Greyhound brothers Benny and Jig in my home. So Mercy was like another one of mine. She knew my home was her home, I was her 2nd mommie, and my dogs were her friends. She loved trying to keep up with the younger hounds. I will never forget the way she'd get all excited whenever my gang burst thru the dog door and into the back yard. Off she'd go, her little hind legs kicking out at an angle, trying to run with the big boys! Anyway, Steph and Ken fell in love with Mercy. That love, and the fact that Mercy was at least 10 years old at the time made their decision easy: they were keeping her the rest of her life, until her final day. That day came yesterday. We will never know anything about the first decade of Mercy's life; but we do know that at the end of her life she was very happy, and very loved by everyone who shared her. She's at the Rainbow Bridge with all the others that went before her, and she's smiling down at Stephanie, Ken, Jig, Benny and me. We all miss and love her.